Years ago, Albert Skaggs handed us an autographed copy of Truett Cathy’s book, It’s Easier To Succeed Than Fail. Albert Skaggs was one of our dearest business mentors, and a personal friend of Truett Cathy, the founder of Chick-fil-A. At the time this Georgia-based chain hadn’t made it’s way up to our little Midwestern city, so we knew very little about them, let alone who Mr. Cathy was. Yet here we are, many years later, and Chick-fil-A has risen to the top of the fast-food industry. They generate more revenue per individual restaurant than any other fast-food chain, even though they take Sundays off. I’d say that’s impressive. 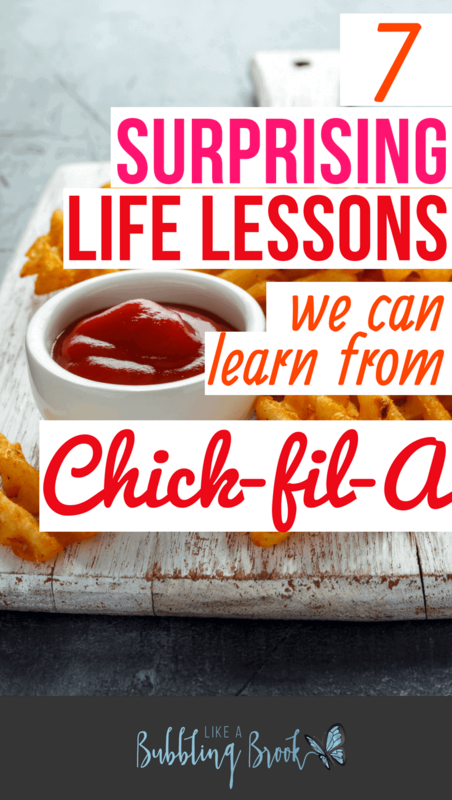 They’re quite remarkable, really, which is why the hubs, kids, and I decided to put together a fun list of surprising life lessons we can learn at Chick-fil-A. We can make that personal, too — just replace the word “Chick-fil-A” with your name, and re-read the statement. We want glorify God by being a faithful steward and have a positive influence on all who God puts in our path. Amen! 2. Create good things that people actually want. I’ve never met a rude Chick-fil-a employee. They’re always courteous, and I know without a doubt that if I remember to say “thank you” I’ll receive a “my pleasure” in return. Now I want to say “my pleasure” every time someone says “thanks” to me. I can’t help myself! They’re so courteous, it’s contagious. 4. Don’t be afraid to be counter-cultural. In a day where most fast-food restaurants majored on beef, they dared to be different and serve up chicken. To top it off, they used that difference to their advantage by using the competition — cows — in their marketing plan. They also took a risk and told the whole world they were closed on Sunday, something hardly any restaurants do. In a time where many people try to minimize differences, it’s good to remember: don’t be afraid to take a stand, embrace what makes you unique, and challenge the status quo when necessary. According to Chick-fil-a’s blog, most of their restaurants have a children’s play area and free wi-fi. Even when you’re busy, you can still carve out a little time for play! They also give their employees Sundays off so they can “rest and worship if they choose.” That sounds like a pretty solid life lesson for all of us. Be sure to carve out some time off for the people and things that matter most. “All work and no play” is a classic recipe for getting old and grouchy. They do whatever they can to make sure you don’t wait in line too long, even on their busiest times of day. To make it easy, they’ll even line up order-takers before you get to the drive-through window so they can get your order ready ASAP. It’s easy and effective, and you’re through the line in a flash. We want to search out ways to facilitate better communication in our family, in ways that are both easy and effective. Easier to forgive, easier to encourage… you get the picture. It’s a little like “whistle while you work” — well, not really, but you get our drift. They’re always happy to take your order, and you never feel like a bother. The whole culture of the place makes you feel good. We want to live life that way; happy, and helping others feel happy when they’re around us, too. What about you? Do you have any inspiring life lessons from Chick-fil-A to add to our list? I’m sure we’ve only scratched the surface!